TORONTO, CANADA ‒ Ivanhoe Mines (TSX: IVN; OTCQX: IVPAF) today announced its financial results for the first quarter ended March 31, 2018. All figures are in U.S. dollars unless otherwise stated. Ivanhoe Mines is a Canadian mining company focused on advancing its three mine-development projects in Southern Africa: The Platreef platinum-palladium-nickel-copper-gold discovery in South Africa; the Kamoa-Kakula copper discovery in the Democratic Republic of Congo (DRC); and the extensive upgrading of the historic Kipushi zinc-copper-lead-germanium mine, also in the DRC. On March 9, 2018, DRC President Joseph Kabila Kabange signed a new mining code into effect that revises and updates the country’s 2002 mining code. The international mining companies that have operations in the DRC, including Glencore, Randgold, China Molybdenum, MMG, Ivanhoe Mines and Zijin Mining, collectively are negotiating with the DRC’s national government to resolve corporate concerns about anticipated impacts on their DRC operations from changes in the new mining code. The DRC mining-code negotiations began in late March, following an initial, high-level meeting in Kinshasa on March 7 during which DRC President Kabila gave an assurance that the companies’ concerns would be resolved through transitional arrangements, mining regulations and respect for existing agreements and guarantees. The international companies have confirmed their willingness to negotiate royalties and changes to other taxes as part of this process. The companies expect that the negotiations will give priority to respecting the legislated guarantee of stability and protection of rights specified in Article 276 of the 2002 mining code, and other protections afforded under established mining conventions and bilateral agreements. Continuing strategic discussions concerning Ivanhoe Mines and its projects are ongoing with several significant mining companies and investors across Asia, Europe, Africa and elsewhere. Several investors that have expressed interest have no material limit on the provision of capital. On February 26, 2018, Ivanhoe announced results of an independently verified, updated Mineral Resource estimate showing that the ultra-high-grade Kakula Discovery alone now contains Indicated Mineral Resources of 174 million tonnes at 5.62% copper, at a 3% copper cut-off grade, and 585 million tonnes at 2.92% copper, at a 1% cut-off. The February 2018 Mineral Resource estimate boosted the combined Kamoa-Kakula Indicated Mineral Resources to 1.03 billion tonnes at 3.17% copper, containing approximately 72 billion pounds of copper, plus an additional 183 million tonnes of Inferred Mineral Resources at 2.31% copper, at a 1.5% cut-off. Thenew Mineral Resource estimate established the Kamoa-Kakula Project as the world’s fourth-largest copper discovery. 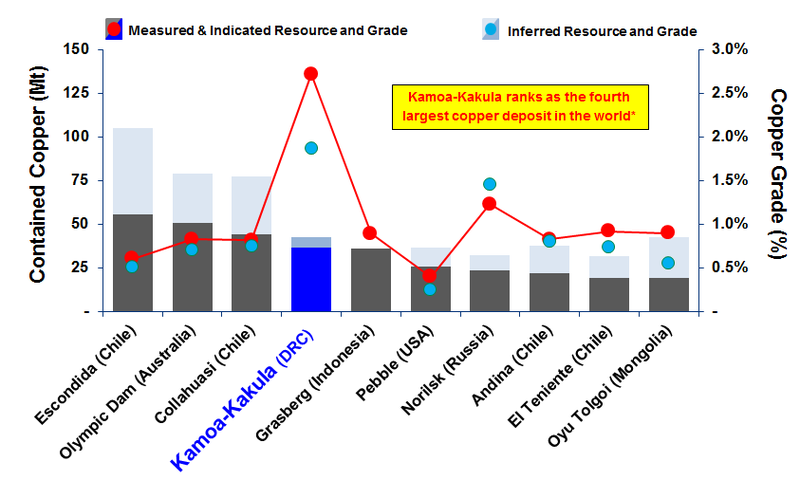 Kamoa-Kakula’s copper grades are the highest, by a wide margin, of the world’s top 10 copper deposits. Kakula’s strike length now extends to more than 13 kilometres and remains open for significant expansion in multiple directions. A total of 13 rigs are continuing with resource expansion and delineation drilling at the project, as well as geotechnical, hydrological and metallurgical drilling. Geophysical surveys were conducted at the Kamoa-Kakula Project to help identify new, high-priority targets in the untested parts of the 400-square-kilometre mining licence. Ivanhoe’s DRC exploration team is continuing with its regional drilling program targeting Kamoa-Kakula-style copper mineralization on its 100%-owned exploration licences in the Western Foreland region, just to the west of the Kamoa-Kakula mining-licence area. The planned initial, six-million-tonne-per-annum (Mtpa) mine at Kakula is estimated to cost $1.2 billion; subsequent expansions and a smelter can be funded from cash flows or project financing. With the new, expanded February 2018 Mineral Resource estimate, Ivanhoe and its joint-venture partner, Zijin Mining, are exploring options to accelerate building of the first two mines at Kamoa-Kakula, and the potential for expanding production to 18 Mtpa and beyond. Underground development at the planned initial mine at Kakula is making steady progress and is expected to reach the high-grade copper mineralization later this year. The service and conveyor declines each have been advanced more than 460 metres through underground development work. 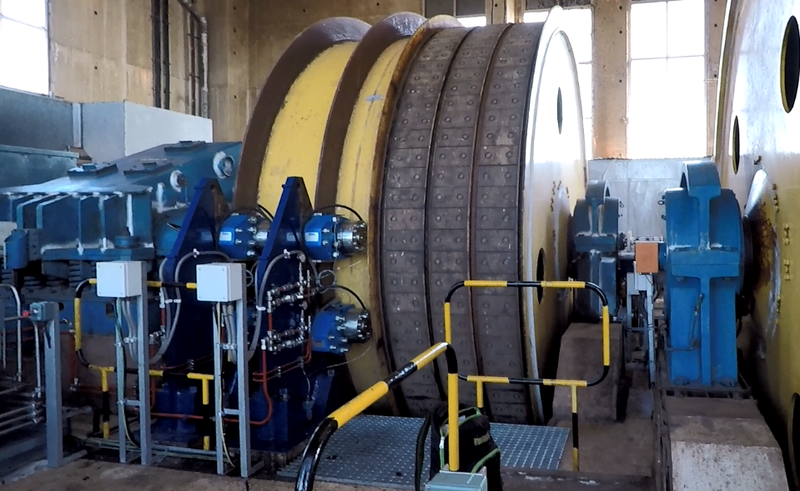 In January 2018, Ivanhoe announced that ongoing upgrading work at the Mwadingusha hydropower plant in the DRC – the first of three existing, state-owned hydroelectric plants that Ivanhoe and Zijin Mining plan to modernize to supply power to Kamoa-Kakula – has increased power output to 32 megawatts (MW). Upgrading of the other two hydroelectric plants – Koni and Nzilo 1 – is expected to begin once Mwadingusha has been fully restored to its installed capacity of 71 MW. Kamoa-Kakula has been conducting project development activities with clean, hydroelectric power drawn from the national grid since late 2016. The Ivanhoe-sponsored Fionet program to improve malaria diagnostics and treatment was expanded in 2017 to 300 Deki Readers installed in 252 medical-service providers in Haut-Katanga and Lualaba provinces in southern DRC, which host Ivanhoe’s Kipushi and Kamoa-Kakula projects. Deki hand-held devices provide automated readings of rapid diagnostic tests to remove the human-error factor and avoid prescription of unnecessary medication. On December 13, 2017, Ivanhoe announced the findings of an independent, pre-feasibility study (PFS) for the redevelopment of the Kipushi zinc-copper-germanium-lead-silver mine in the DRC. The PFS analyzed the plan to bring Kipushi’s Big Zinc Zone into production in less than two years, with a life-of-mine, average annual production rate of 225,000 tonnes of zinc and cash costs of $0.48 per pound of zinc. Based on the findings of an independent, pre-feasibility study (PFS) issued in December 2017, Kipushi is expected to have average annual production of 381,000 tonnes of zinc concentrate over an 11-year, initial mine life at a total cash cost of approximately $0.48 per pound of zinc. The PFS focuses on the initial mining of Kipushi’s Big Zinc orebody, which has an estimated 10.2 million tonnes of Measured and Indicated Mineral Resources grading 34.9% zinc. 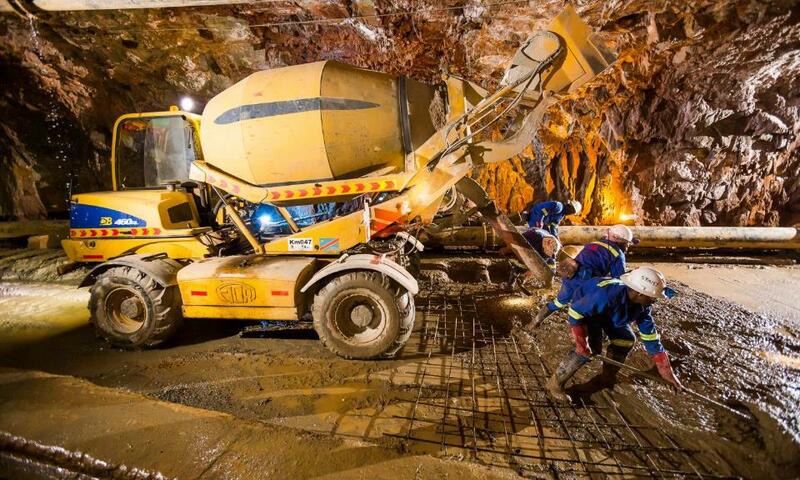 Ivanhoe has made significant progress in upgrading the mine’s underground infrastructure and the planned return to production would establish Kipushi as the world’s highest-grade, major zinc mine. At the Platreef platinum-palladium-nickel-copper-gold discovery in South Africa, sinking of Shaft 1 reached a depth of 750 metres below surface on April 23, 2018. Development of the second of four planned shaft stations – the 750-metre-level station – has begun. Shaft 1 is expected to reach the top of the Flatreef orebody, at a depth of approximately 783 metres, in the third quarter of this year. Sinking of the shaft will continue to a planned final depth of 980 metres. Surface construction for Platreef’s Shaft 2 is progressing. Blasting and excavation of a box cut to a depth ofapproximately 29 metres below surface is underway, and construction of a concrete hitch for the headframe is expected to be completed by the end of this year. On May 7, 2018, Ivanhoe announced the signing of an agreement to provide local, treated bulk water for the first phase of production at Platreef. The agreement is for the supply of a minimum of five million litres of treated water a day for 32 years, beginning in 2022, from the town of Mokopane’s new Masodi treatment plant. Platreef expects to begin receiving a small quantity of treated water this year, which will be used in ongoing underground mine development and surface infrastructure construction. Based on the findings of an independent, definitive feasibility study issued in July 2017, the Platreef Mine is projected to be Africa’s lowest-cost producer of platinum-group metals, with a cash cost of $351 per ounce of platinum, palladium, rhodium and gold (3PE+Au), net of by-products, including sustaining capital cost. Ivanhoe has appointed five leading mine-financing institutions as Initial Mandated Lead Arrangers to arrange debt financing for the Platreef Mine’s development. They are: KfW IPEX-Bank, a 100% subsidiary of the German promotional bank KfW; Swedish Export Credit Corporation; Export Development Canada; Nedbank Limited (acting through its Corporate and Investment Banking division); and Societe Generale Corporate & Investment Banking. Expressions of interest have been received for approximately $900 million of the targeted $1 billion project financing. On April 25, 2018, Ivanhoe issued its initial Sustainability Report. The report provides an overview of Ivanhoe’s sustainability programs and initiatives conducted in 2017, highlighting the significant accomplishments achieved and the new goals set for current and future corporate activities. At the end of Q1 2018, Platreef had recorded 562,000 work hours free of lost-time injuries, Kipushi 905,000 hours and Kamoa-Kakula more than 9.58 million hours. The Platreef Project is owned by Ivanplats (Pty) Ltd, which is 64%-owned by Ivanhoe Mines. A 26% interest is held by Ivanplats’ historically-disadvantaged, broad-based, black economic empowerment (B-BBEE) partners, which include 20 local host communities with a total of approximately 150,000 people, project employees and local entrepreneurs.In April 2018,Ivanplats reconfirmed its Level 3 status in its fourth verification assessment on a B-BBEE scorecard. A Japanese consortium of ITOCHU Corporation, Japan Oil, Gas and Metals National Corporation and Japan Gas Corporation owns a 10% interest in Ivanplats, which it acquired in two tranches for a total investment of $290 million. The Platreef Project hosts an underground deposit of thick, platinum-group metals, nickel, copper and gold mineralization on the Northern Limb of the Bushveld Igneous Complex in Limpopo Province, approximately 280 kilometres northeast of Johannesburg and eight kilometres from the town of Mokopane. On the Northern Limb, platinum-group metals mineralization is hosted primarily within the Platreef, a mineralized sequence that is traced more than 30 kilometres along strike. Ivanhoe’s Platreef Project, within the Platreef’s southern sector, is comprised of two contiguous properties: Turfspruit and Macalacaskop. Turfspruit, the northernmost property, is contiguous with, and along strike from, Anglo Platinum’s Mogalakwena group of mining operations and properties. At the end of Q1 2018, the Platreef Project reached a total of 562,276 lost-time, injury-free hours worked in terms of South Africa’s Mine Health and Safety Act and Occupational Health and Safety Act. The Platreef Project continues to strive toward its workplace objective of an environment that causes zero harm to employees, contractors, sub-contractors and consultants. On July 31, 2017, Ivanhoe Mines announced the positive results of an independent, definitive feasibility study (DFS) for the planned first phase of the Platreef Project’s platinum-group metals, nickel, copper and gold mine in South Africa. The Platreef DFS covers the first phase of development that would include construction of a state-of-the-art underground mine, concentrator and other associated infrastructure to support initial production of concentrate by 2022. As Phase 1 is being developed and commissioned, there would be opportunities to refine the timing and scope of subsequent phases of expanded production. Indicated Mineral Resources containing an estimated 41.9 million ounces of platinum, palladium, rhodium and gold, with an additional 52.8 million ounces of platinum, palladium, rhodium and gold in Inferred Resources. Increased Mineral Reserves containing 17.6 million ounces of platinum, palladium, rhodium and gold, following stope optimization and mine sequencing work. Development of a large, safe, mechanized, underground mine, with an initial four-Mtpa concentrator and associated infrastructure. Planned initial average annual production rate of 476,000 ounces of platinum, palladium, rhodium and gold (3PE+Au), plus 21 million pounds of nickel and 13 million pounds of copper. The DFS was prepared for Ivanhoe Mines by principal consultant DRA Global, with economic analysis led by OreWin, and specialized sub-consultants including Amec Foster Wheeler E&C Services (Amec Foster Wheeler), Stantec Consulting, Murray & Roberts Cementation, SRK Consulting, Golder Associates and Digby Wells Environmental. During 2017, Ivanhoe announced the appointment of five leading financial institutions to arrange project financing for the development of the Platreef Project. The five Initial Mandated Lead Arrangers (IMLAs) will make best efforts to arrange a total debt financing of up to $1 billion for the development of Platreef’s first-phase, four Mtpa mine. Preliminary expressions of interest have been received for approximately $900 million of the targeted $1 billion financing. Negotiation of a term sheet is ongoing. In addition, preliminary discussions have begun with leading financial institutions around the financing of the black economic empowerment partners’ contribution to the development capital. The IMLAs appointed Export Development Canada to direct the technical, environmental and social due diligence phase of the project. Chlumsky, Armbrust & Meyer and IBIS ESG South Africa Consulting were appointed as Independent Technical Consultant and Independent Social and Environmental Consultant, respectively. On April 23, 2018, Ivanhoe announced that Platreef’s Shaft 1 had reached a depth of 750 metres below surface and lateral development of the first mine-access station now is underway. The station on Shaft 1’s 750-metre level will provide initial, underground access to the high-grade orebody, enabling mine development to proceed during the construction of Shaft 2, which will become the mine’s main production shaft. The mining zones in the current Platreef Mine plan occur at depths ranging from approximately 700 metres to 1,200 metres below surface. The 750-metre-level station also will allow access for the first raise-bore shaft that will provide ventilation to the underground workings during the mine’s ramp-up phase. Sinking of Shaft 1 will resume after the station is completed. The shaft is expected to intersect the upper contact of the Flatreef Deposit (T1 mineralized zone) at an approximate shaft depth of 783 metres. As shaft sinking advances, two additional shaft stations will be developed at mine-working depths of 850 metres and 950 metres. Shaft 1 is expected to reach its projected, final depth of 980 metres below surface in 2019. Shaft 1, with an internal diameter of 7.25 metres, will provide access to the Flatreef Deposit and enable the initial, underground development to take place during the development of Shaft 2. Ultimately, Shaft 1 will become the primary ventilation intake shaft during the project’s four-Mtpa production case. Jerry Molongama, a contract employee from Aveng Mining, securing the jumbo drilling rig on surface at Shaft 1. Construction of the station at the 750-metre level now is underway to provide initial mine development access to the orebody. Shaft 2, to be located approximately 100 metres northeast of Shaft 1, will have an internal diameter of 10 metres, will be lined with concrete and sunk to a planned, final depth of more than 1,104 metres below surface. It will be equipped with two, 40-tonne, rock-hoisting skips capable of hoisting a total of six million tonnes of ore a year – the single largest hoisting capacity at any mine in Africa. The headgear for the permanent hoisting facility was designed by South Africa-based Murray & Roberts Cementation. The first three blasts for Shaft 2’s box cut were successfully completed in April; three additional blasts are planned. The blasting will enable the excavation of the box cut to a depth of approximately 29 metres below surface and the construction of the concrete hitch (foundation) for the 103-metre-tall concrete headgear (headframe) that will house the shaft’s permanent hoisting facilities and support the shaft collar. Excavation of the box cut and construction of the tower hitch foundation is expected to be completed by the end of this year. Drilling blast holes for the Shaft 2 box-cut construction. Removal of broken rock after a blast as part of the box-cut construction for Shaft 2. Ivanhoe plans to develop the Platreef Mine in phases. The initial annual production rate of four million tonnes per annum (Mtpa) is designed to establish an operating platform to support future expansions. This is expected to be followed by a potential doubling of production to eight Mtpa, and then a third expansion phase to a steady-state 12 Mtpa, which would establish Platreef among the largest platinum-group-metals mines in the world. The mining zones in the current Platreef mine plan occur at depths ranging from approximately 700 metres to 1,200 metres below surface. Primary access to the mining zones will be by way of Shaft 2; secondary access will be via Shaft 1. During mine production, both shafts also will serve as ventilation intakes. Three additional ventilation exhaust raises are planned to achieve steady-state production. Planned mining methods will use highly productive, mechanized methods, including long-hole stoping and drift-and-fill. Each method will utilize cemented backfill for maximum ore extraction. The ore will be hauled from the stopes to a series of internal ore passes and fed to the bottom of Shaft 2, where it will be crushed and hoisted to surface. The current mine plan has been improved beyond the earlier projections in the 2015 PFS mine plan by optimizing stope design, employing a declining Net Smelter Return (NSR) strategy and targeting higher-grade zones early in the mine’s life. This strategy has increased the grade profile by 23% on a 3PE+Au basis in the first 10 years of operation and by 10% during the life of the mine. On May 7, 2018, Ivanhoe announced the signing of a new agreement to provide local, treated water to supply most of the bulk water needed for the first phase of production at Platreef. 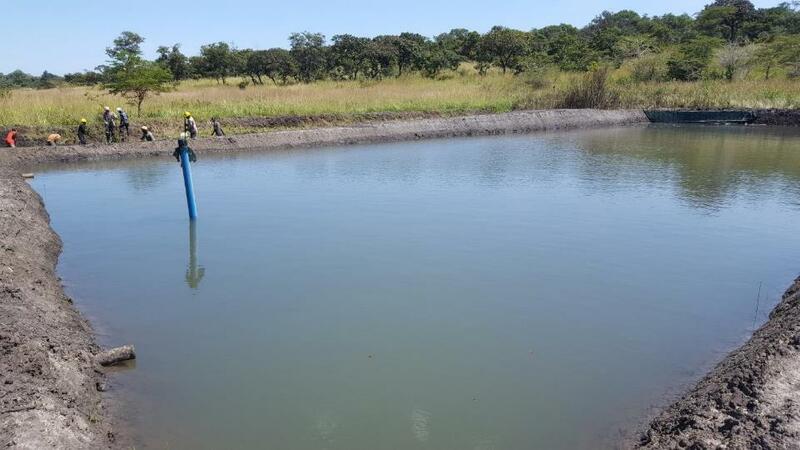 The Mogalakwena Local Municipality has agreed to supply a minimum of five million litres of treated water a day for 32 years, beginning in 2022, from the town of Mokopane’s new Masodi Treatment Works. Ivanplats expects to begin receiving a small quantity of processed wastewater this year, after the Masodi plant has been commissioned. The initial supply will be used in Platreef’s ongoing underground mine development and surface infrastructure construction. Under terms of the agreement, which is subject to certain suspensive conditions, Ivanplats will provide financial assistance to the municipality for certified costs of up to a maximum of R248 million (approximately $19.6 million) to complete the Masodi treatment plant. Ivanplats will purchase the treated wastewater at a reduced rate of R5 per thousand litres for the first 10 million litres/day to offset a portion of the initial capital contributed. Work progressed on the implementation of Ivanhoe’s Social and Labour Plan (SLP). The company has pledged a total of R160 million ($13 million) during the first five years, culminating in November 2019. The approved plan includes R67 million ($6 million) for the development of job skills among local residents and R88 million ($7 million) for local economic development projects. The Kipushi copper-zinc-germanium-lead mine, in the Democratic Republic of Congo, is adjacent to the town of Kipushi and approximately 30 kilometres southwest of Lubumbashi. It is located on the Central African Copperbelt, approximately 250 kilometres southeast of the Kamoa-Kakula Project and less than one kilometre from the Zambian border. Ivanhoe acquired its 68% interest in the Kipushi Project in November 2011; the balance of 32% is held by the state-owned mining company, La Générale des Carrières et des Mines (Gécamines). At the end of Q1 2018, the Kipushi Project had achieved a total 905,347 work hours free of lost-time injuries. The Kipushi Project also operates a potable-water station to supply the municipality with water. This includes power supply, disinfectant chemicals, routine maintenance, security and emergency repair of leaks to the primary reticulation. A new overhead powerline to the pump station recently was installed and commisioned. The Ivanhoe-sponsored Fionet program to improve malaria diagnostics and treatment was expanded in 2017, with a total of 300 Deki Readers installed in 252 medical-service providers in Haut-Katanga and Lualaba provinces in southern DRC, which host Ivanhoe’s Kipushi and Kamoa-Kakula projects. Deki devices provide automated readings of rapid, diagnostic tests to remove the human-error factor and avoid prescription of unnecessary medication. The data are uploaded to a cloud server for analysis by the Ministry of Health in planning malaria-control measures. Deki Readers provided diagnostic testing in more than 30,000 patient encounters during 2017, with approximately 63% of patients testing negative for malaria. 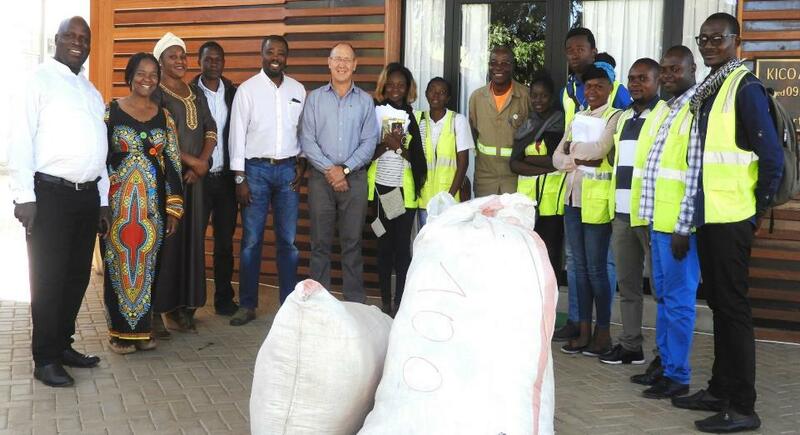 On April 25, 2018, in recognition of World Malaria Day, Pierre Joubert, KICO General Manager (centre, in blue shirt), distributed 1,000 mosquito-proof bed nets to Kipushi community members. Ivanhoe initiated a second phase of underground drilling at Kipushi in April 2017 with the goal of upgrading Inferred Mineral Resources on the Southern Zinc and Fault zones to Indicated, expanding Mineral Resources in the Série Recurrent Zone and collecting additional sample material for metallurgical flotation testing. The drilling program was completed in November 2017, with a total of 9,706 metres drilled in 58 holes. Eight holes were drilled for metallurgy, 31 holes in the Southern Zinc and Big Zinc, five holes in the Nord Riche and 14 holes in the Série Récurrente. Logging and sampling of the holes was completed at the end of 2017 and the final assays have been received. Geological interpretation of the results is ongoing and a new resource update is planned for release in Q2 2018. The updated Mineral Resource will be used in the preparation of the Kipushi Feasibility Study. Ivanhoe completed the upgrading of a significant amount of underground infrastructure at the Kipushi Project, including a series of vertical mine shafts to various depths, with associated head frames, as well as underground mine excavations. A series of crosscuts and ventilation infrastructure still are in working condition. The underground infrastructure also includes a series of pumps to manage the influx of water into the mine. Shaft 5, the main production shaft for the Kipushi Mine, is eight metres in diameter and 1,240 metres deep. It now has been upgraded and re-commissioned. The main personnel and material winder has been upgraded and modernized to meet international industry standards and safety criteria. The Shaft 5 rock-hoisting winder now is fully operational. Underground upgrading work is continuing on the crusher and the rock load-out facilities at the bottom of Shaft 5 and on the main haulage way on the 1,150-metre level, between the Big Zinc access decline and Shaft 5. Pouring concrete for the new roadway on Kipushi’s main haulage way at the 1,150-metre level. have been successfully tested to international standards. On December 13, 2017, Ivanhoe Mines announced the results of a pre-feasibility study for the rebirth of the historic Kipushi Mine. The study anticipates annual production of an average of 381,000 tonnes of zinc concentrate over an 11-year, initial mine life at a total cash cost of approximately $0.48 per pound of zinc. After-tax net present value (NPV) at an 8% real discount rate of $683 million. After-tax real internal rate of return (IRR) of 35.3%. After-tax project payback period of 2.2 years. Pre-production capital costs, including contingency, estimated at $337 million. Existing surface and underground infrastructure allows for significantly lower capital costs than comparable greenfield development projects. Life-of-mine average planned zinc concentrate production of 381,000 dry tonnes per annum, with a concentrate grade of 59% zinc, is expected to rank Kipushi, once in production, among the world’s largest zinc mines. Estimated life-of-mine average cash cost of $0.48 per pound of zinc is expected to rank Kipushi, once in production, in the bottom quartile of the cash-cost curve for zinc producers internationally. The definitive feasibility study, to further refine and optimize the project’s economics, is underway and is expected to be completed in the second half of 2018. On October 30, 2017, Ivanhoe Mines and the DRC’s state-owned railway company, Société Nationale des Chemins de Fer du Congo (SNCC), signed a Memorandum of Understanding (MOU) to rebuild 34 kilometres of track to connect the Kipushi Mine with the DRC national railway at Munama, south of the mining capital of Lubumbashi. Under the terms of the MOU, Ivanhoe has appointed R&H Rail to conduct a front-end engineering design study to assess the scope and cost of rebuilding the spur line from the Kipushi Mine to the main Lubumbashi-Sakania railway at Munama. The study is underway and construction on the Kipushi-Munama spur line could start later this year. Ivanhoe will finance the estimated $32 million (plus contingency) capital cost for the rebuilding, which is included within the overall Kipushi 2017 PFS capital cost. The proposed export route is to utilize the SNCC network from Kipushi to Ndola, connecting to the north-south rail corridor from Ndola to Durban. The rail corridor to Durban via Zimbabwe is fully operational and has significant excess capacity. 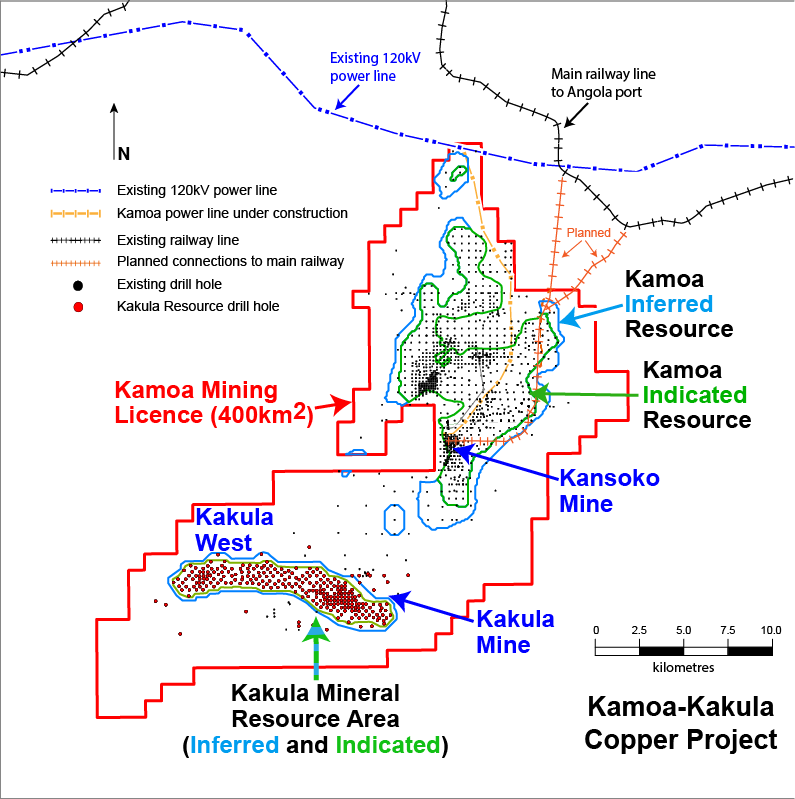 The Kamoa-Kakula Copper Project, a joint venture between Ivanhoe Mines and Zijin Mining, has been independently ranked as the largest copper discovery ever made on the African continent, with adjacent prospective exploration areas within the Central African Copperbelt in the Democratic Republic of Congo, approximately 25 kilometres west of the town of Kolwezi and about 270 kilometres west of Lubumbashi. Ivanhoe sold a 49.5% share interest in Kamoa Holding to Zijin Mining in December 2015 for an aggregate consideration of $412 million. In addition, Ivanhoe sold a 1% share interest in Kamoa Holding to privately-owned Crystal River for $8.32 million – which Crystal River will pay through a non-interest-bearing, 10-year promissory note. Since the conclusion of the Zijin transaction in December 2015, each shareholder has been required to fund expenditures at the Kamoa-Kakula Project in an amount equivalent to its proportionate shareholding interest in Kamoa Holding. A 5%, non-dilutable interest in the Kamoa-Kakula Project was transferred to the DRC government on September 11, 2012, for no consideration, pursuant to the 2002 DRC mining code. Following the signing of an agreement with the DRC government in November 2016, in which an additional 15% interest in the Kamoa-Kakula Project was transferred to the DRC government, Ivanhoe and Zijin Mining now each hold an indirect, 39.6% interest in the Kamoa-Kakula Project, Crystal River holds an indirect 0.8% interest and the DRC government holds a direct 20% interest. Kamoa Holding holds an 80% interest in the project. 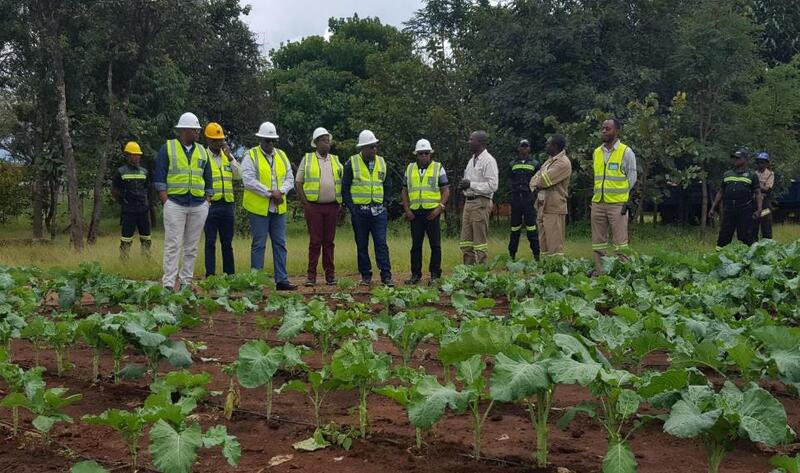 Health and safety remain key priorities for all people working at the Kamoa-Kakula Project, which had achieved 9,588,390 lost-time, injury-free hours worked to the end of Q1 2018. This outstanding achievement reflects the dedication and safety-focused culture of the entire Kamoa-Kakula exploration and development teams. 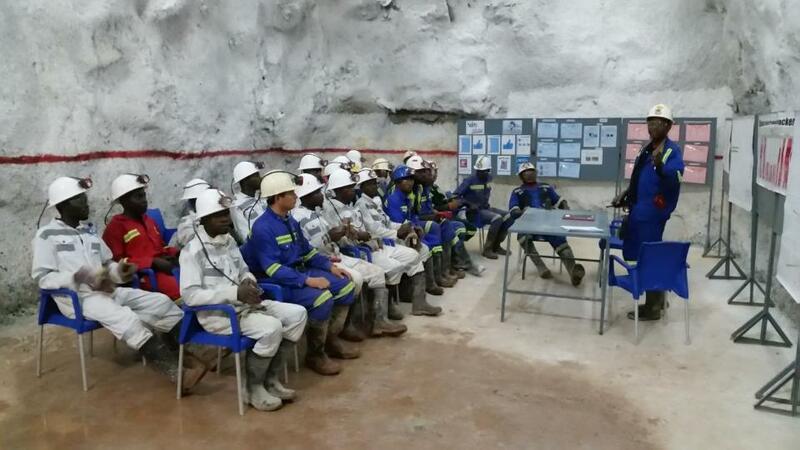 Pre-shift safety meeting in one of the Kakula’s underground safety refuge areas. Kamoa-Kakula team members and contractors now have surpassed 9.6 million hours worked without a lost-time injury. On February 26, 2018, Ivanhoe issued an updated Mineral Resource estimate for the Kamoa-Kakula Project. The updated estimate included an update to the Kakula Mineral Resource estimate and was prepared by Ivanhoe Mines under the direction of Amec Foster Wheeler E&C Services Inc., of Reno, USA, in accordance with the 2014 CIM Definition Standards for Mineral Resources and Mineral Reserves. The Qualified Persons for the Kamoa-Kakula Mineral Resource estimate are Dr. Harry Parker, RM, SME and Gordon Seibel, RM, SME, both of Amec Foster Wheeler E&C Services Inc. The combined Kamoa-Kakula Project’s Indicated Mineral Resources now total 1,340 million tonnes grading 2.72% copper, containing 80.7 billion pounds of copper at a 1.0% copper cut-off grade and a minimum thickness of three metres. Kamoa-Kakula also now has Inferred Mineral Resources of 315 million tonnes grading 1.87% copper and containing 13.0 billion pounds of copper, also at a 1.0% copper cut-off grade and a minimum thickness of three metres. The new Kakula estimate covers a mineralized strike length of 13.3 kilometres. For the first time, the updated estimate incorporates Mineral Resources contained in the Kakula West Discovery area and the saddle area between the main Kakula Discovery area and Kakula West. The updated Mineral Resource estimate is based on results from approximately 151,000 metres of drilling in 271 holes completed by December 31, 2017. Kakula’s Indicated Mineral Resources now total 585 million tonnes at a grade of 2.92% copper, containing 37.7 billion pounds of copper at a 1% copper cut-off. At a 2% copper cut-off, Indicated Mineral Resources total 330 million tonnes at a 4.07% copper grade, containing 29.6 billion pounds of copper. At a 3% copper cut-off, Indicated Mineral Resources total 174 million tonnes at a grade of 5.62% copper, containing 21.5 billion pounds of copper. Inferred Mineral Resources total 113 million tonnes at a grade of 1.90% copper, containing 4.7 billion pounds of copper at a 1% copper cut-off. At a 2% copper cut-off, Inferred Mineral Resources total 44 million tonnes at a 2.59% copper grade, containing 2.5 billion pounds of copper. At a 3% copper cut-off, Inferred Mineral Resources total nine million tonnes at a grade of 3.66% copper, containing 0.7 billion pounds of copper. The average true thickness of the selective mineralized zone (SMZ) at a 1% copper cut-off is 10.1 metres in the Indicated Mineral Resources area and 6.7 metres in the Inferred Mineral Resources area. At a higher 3% copper cut-off, the average true thickness of the SMZ is 4.7 metres in the Indicated Mineral Resources area and 3.3 metres in the Inferred Mineral Resources area. The Kakula Mineral Resources are defined within a total area of 24.9 square kilometres at a 1% copper cut-off. At the same cut-off grade, the areal extent of Indicated Mineral Resources is 19.4 square kilometres and the areal extent of the Inferred Mineral Resources is 5.5 square kilometres. The Kakula Discovery remains open for significant expansion in multiple directions, while the remainder of the southern parts of the Kamoa-Kakula mining-licence area is virtually untested. Kamoa-Kakula mining licence, showing the Kakula and Kansoko mines, and the Kamoa, Kakula and Kakula West Mineral Resource areas. Kamoa-Kakula has the highest copper grades by a wide margin. *Note: Selected based on contained copper (Measured & Indicated Mineral Resources, inclusive of Mineral Reserves, and Inferred Mineral Resources), ranked on contained copper in Measured & Indicated Mineral Resources. On November 28, 2017, Ivanhoe Mines announced positive findings of an expanded, independent, preliminary economic assessment (PEA) for the development of the Kakula Discovery at the Kamoa-Kakula Project. For this option, the PEA envisaged an average annual production rate of 246,000 tonnes of copper at a mine-site cash cost of $0.45 per pound of copper and total cash cost of $1.08 per pound of copper for the first five years of operations, and copper annual production of up to 385,000 tonnes by year four. An initial capital cost of $1.2 billion for this option would result in an after-tax net present value at an 8% discount rate (NPV8%) of $4.2 billion. The internal rate of return of 36.2% and project payback period of 3.1 years confirm the compelling economics for Kamoa-Kakula’s initial phase of production. Kakula would benefit from an ultra-high, average feed grade of 6.4% copper during the first 10 years of operations, and 5.5% copper on average during a 24-year mine life. A six-Mtpa Kakula pre-feasibility study (PFS) is underway, with completion targeted for the second half of 2018. Kakula’s surface box cut was completed in October 2017. Development of twin underground declines, similar to those at the nearby Kansoko Mine, has begun and is expected to take about a year to complete. The first blast for the declines was completed in November 2017. Under this option, initial production would occur at a rate of six-Mtpa from the Kakula Mine, before increasing to 12-Mtpa with ore from the Kansoko Mine. 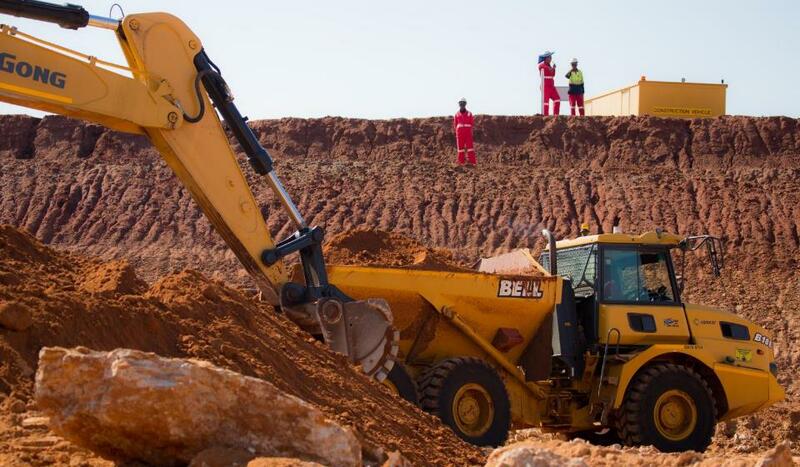 As resources at Kakula and Kansoko are mined, the PEA envisages that production would begin at Kamoa North to maintain 12-Mtpa throughput during a 44-year mine life. For the two-phase, sequential operation, the PEA envisaged $1.2 billion in initial capital costs. Future expansion at the Kansoko Mine and subsequent extensions could be funded by cash flows from the Kakula Mine, resulting in an after-tax, net present value at an 8% discount rate (NPV8%) of $7.2 billion and an internal rate of return of 33%. Under this approach, the PEA also included the construction of a direct-to-blister, flash-copper smelter with an annual capacity of 690,000 tonnes of copper concentrate to be funded from internal cash flows. This would be completed in the fifth year of operations, achieving significant savings in treatment charges and transportation costs. The 12-Mtpa scenario would deliver average annual production of 370,000 tonnes of copper at a total cash cost of $1.02 per pound of copper during the first 10 years of operations and production of 542,000 tonnes by year nine. At this future production rate, Kamoa-Kakula would rank among the world’s five largest copper mines. Under this scenario, the PFS envisages an average annual production rate of 178,000 tonnes of copper for the first 10 years of operations, and annual copper production of 245,000 tonnes by year seven. The initial capital cost of $1.0 billion to develop this mine would result in an after-tax, net present value of $2.1 billion at an 8% discount rate (NPV8%) – an increase of 109% compared to the net present value projected in the March 2016 Kamoa PFS. The internal rate of return is expected to be 24%, with a five-year project payback period. Potential phased mine developments to 18-Mtpa and above are under evaluation for Kamoa-Kakula. In light of the successful, step-out drilling at Kakula West, as well as the potential to find additional resources in high-priority targets located in the untested parts of the Kamoa-Kakula Project, development plans will be reassessed and amended as the project moves forward. The Kakula six-Mtpa PFS has begun. The work will be based on an updated Kakula 3-D resource model. The target date for completion is at the end of Q3 2018. 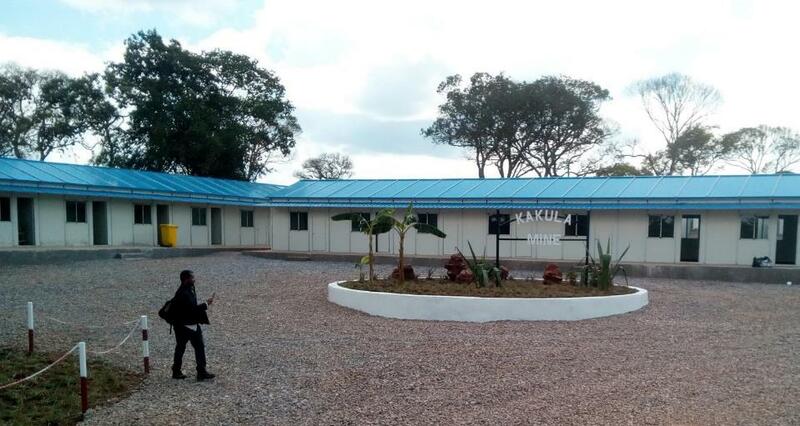 New offices at the Kakula Mine site. At the end of Q1 2018, each of the twin declines at Kakula had been advanced more than 360 metres from the portal face toward the mineralized zone. Detailed engineering and design activities to allow equipping of the decline already are at an advanced stage to enable early procurement of conveyors, drives and ancillary equipment to ensure the conveyor decline is fully functional once the high-grade mineralized zone has been intersected. The 3,535-metre decline development contract is scheduled to be completed by the end of 2018. Workers scaling loose rock in one of Kakula’s twin declines to prepare the working face for drilling. Both declines continue to make steady advancement toward the high-grade copper deposit. 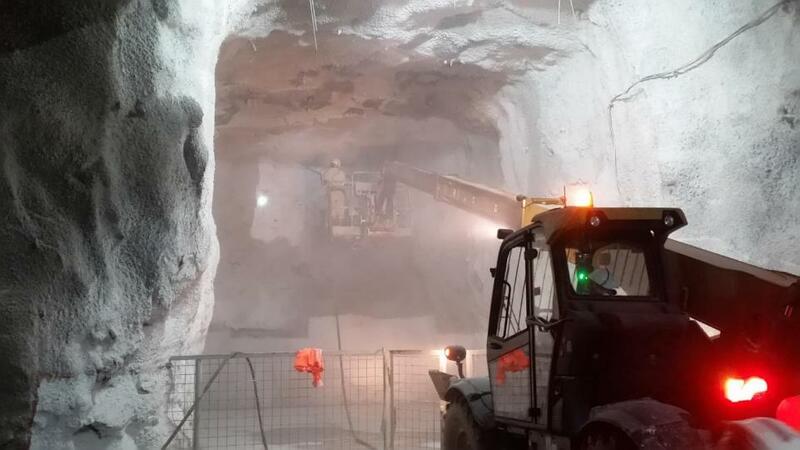 Underground development at Kamoa-Kakula’s Kansoko Mine, consisting of service and conveyor declines, was completed by Byrnecut Underground Congo SARL in September 2017. The high-grade Kansoko Sud copper mineralization was reached and approximately 13,500 tonnes of development ore was stockpiled at surface. Various development options for Kansoko are being assessed in conjunction with the ongoing mine development activities at Kakula. 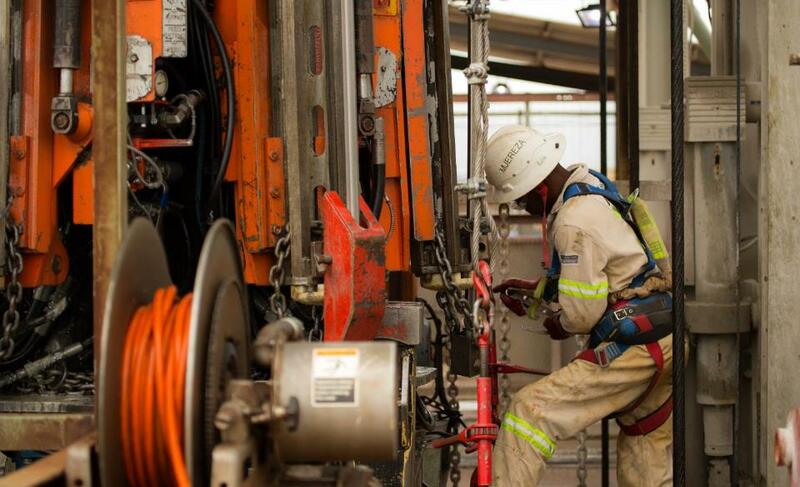 Thirteen rigs are drilling at Kakula and surrounding areas. As of the end of Q1 2018, a total of 18,293 metres had been drilled for the year to date. Drilling to delineate an expanded Indicated resource to include Kakula West was completed early in the quarter. Further drilling was directed to infill, step-out and to inform metallurgical, hydrogeological and civil geotechnical studies. A seismic survey began early in February to acquire data on a series of seismic lines planned across the Kamoa and Kakula deposit areas. A total of 74 kilometres of lines were surveyed, including a 10-kilometre line done at variable spacing to test near-surface reflectors. The survey was demobilized at the end of the March as the remaining lines were on water-logged grasslands, which are expected to be suitable for work to resume in May. Interpretation of the initial lines appears promising. In January of this year, Ivanhoe announced that ongoing upgrading work at the Mwadingusha hydropower plant in the DRC had almost tripled the plant’s interim power output from 11 to 32 megawatts (MW). This represents 45% of the plant’s designed capacity. Three of Mwadingusha’s six generators now have been modernized; the remaining three generators are due to be upgraded and fully operational by the end of 2019 – restoring the plant to its installed output capacity of approximately 71 MW of power. The work at Mwadingusha, part of a program to eventually overhaul and boost output from three hydropower plants, is being conducted by engineering firm Stucky, of Lausanne, Switzerland, under the direction of Ivanhoe Mines and its joint-venture partner, Zijin Mining Group, in conjunction with the DRC’s state-owned power company, La Société Nationale d’Electricité (SNEL). Once fully reconditioned, the three plants will have combined installed capacity of approximately 200 MW of electricity for the national grid, which is expected to be more than sufficient for the Kamoa-Kakula Copper Project. The Kansoko Mine, Kakula Mine and Kamoa camp have been connected to the national, hydroelectric power grid, since the completion of a 12-kilometre, 120kV, dual-circuit power line between Kansoko and Kakula last December. The Kamoa-Kakula Sustainable Livelihoods program is committed to sustainable development in the communities within the project’s footprint. The main objective of the Livelihoods program is to enhance food security and the living standards of the people who reside within the project’s footprint. The program is mainly implemented through fish farming and agriculture activities, such as maize, vegetable, poultry production, and beekeeping. Activities for Q1 2018 included the application of fertilizers to community maize fields, milling of maize-mealie meal for distribution to workers, construction of a community fish pond in the Tshimbuji area near Kakula, planting of citrus fruits and vegetables at the Livelihoods demonstration gardens, training communities in vegetable and poultry production, preparation of land for banana production, planting of pineapples, and servicing of the maize milling plant. Members of the DRC Parliament inspect one of the Livelihood gardens at the Kamoa-Kakula Project, as part of a site visit to the project. Construction of a new fish pond at one of the local villages, near the Kamoa-Kakula Project, as part of the project’s community initiatives. On March 9, 2018, DRC President Joseph Kabila Kabange signed a new mining code into effect that revises and updates the country’s 2002 mining code. International mining companies that have operations in the DRC, including Randgold Resources, Glencore, Ivanhoe Mines, Gold Mountain International/Zijin Mining Group, MMG, Crystal River Global, China Molybdenum Co. and AngloGold Ashanti, are collectively negotiating with the government to resolve their concerns about impacts on their DRC operations that would result from the new mining code. The industry group submitted a formal proposal to the DRC’s Ministry of Mines on March 29 to address concerns about the new code, notably the stability clauses embodied in the previous code, which included taxation, customs and exchange control. The industry’s proposal included a provision for a sliding scale on royalties for copper, cobalt and gold that, in the industry’s view, would be a more effective mechanism for the government to share in higher commodity prices than the windfall tax on strategic minerals envisaged in the new mining code. While the Ministry of Mines has not yet formally responded to the industry’s proposal, there has been constructive engagement through the working groups set up to draft the regulations to implement the law, and with the all-important Civil Society leadership, along with other industry and government counterparts. The mining industry group believes a way forward could be found that would be in the best interests of all parties. A mutually acceptable solution would support and encourage the substantial investments the DRC requires for the optimal development of its mineral resources and the growth of its economy. Ivanhoe’s DRC exploration group is targeting Kamoa-Kakula-style copper mineralization through a regional drilling program on its 100%-owned Western Foreland exploration licences, located to the west of the Kakula-Kamoa Project. Ivanhoe successfully continued exploration through the rainy season during Q1 2018 from its new, standalone exploration camp. 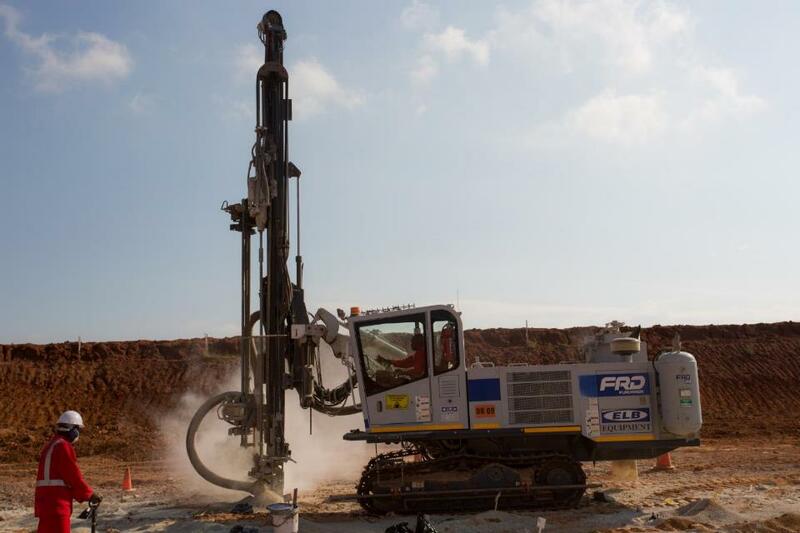 Drilling focused on one of the company's promising targets utilizing the new, all-weather road that connects the Kamoa-Kakula road network to the Western Foreland exploration licences. Swampy ground conditions and limited access west of the Lufupa River restricted the areas available for drill testing. Assessment of regional data continued during the quarter to identify priority exploration targets for dry-season drilling programs during Q2 and Q3. High-grade copper trends emanating from Kamoa are expected to be targeted on the licences north and northwest of Kamoa Nord, in addition to a number of targets resulting from the recent gravity survey on the licences west of Kamoa. Target areas identified from the airborne gravity survey are to be initially followed up with detailed ground-based geophysics. During Q1 2018, Ivanhoe's exploration team completed 6,180 metres in 14 holes of drilling and finalized detailed interpretation of the Makoko high-grade zone. Acquisition of 11 kilometres of 2-D seismic data was completed on the licences west of Kakula; processing is in progress. The company recorded a total comprehensive profit of $3.9 million for Q1 2018 compared to a total comprehensive loss of $5.0 million for the same period in 2017. 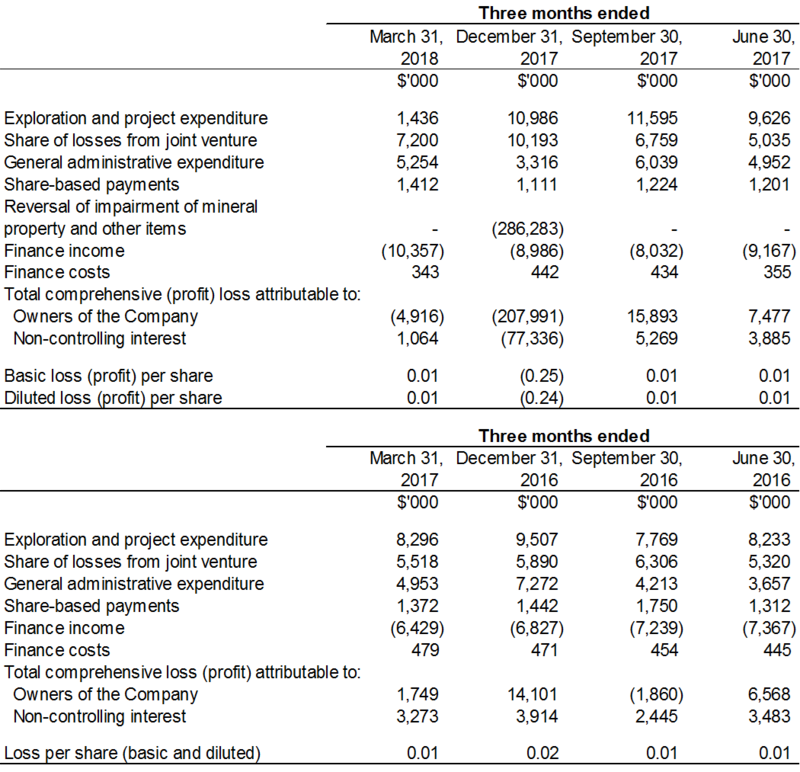 The profit mainly was due to a $5.7 million increase in exchange gains on translation of foreign operations, as well as a $6.9 million decrease in exploration and project expenditure. Exploration and project expenditures for the three months ending March 31, 2018, amounted to $1.4 million and were $6.9 million less than for the same period in 2017 ($8.3 million). 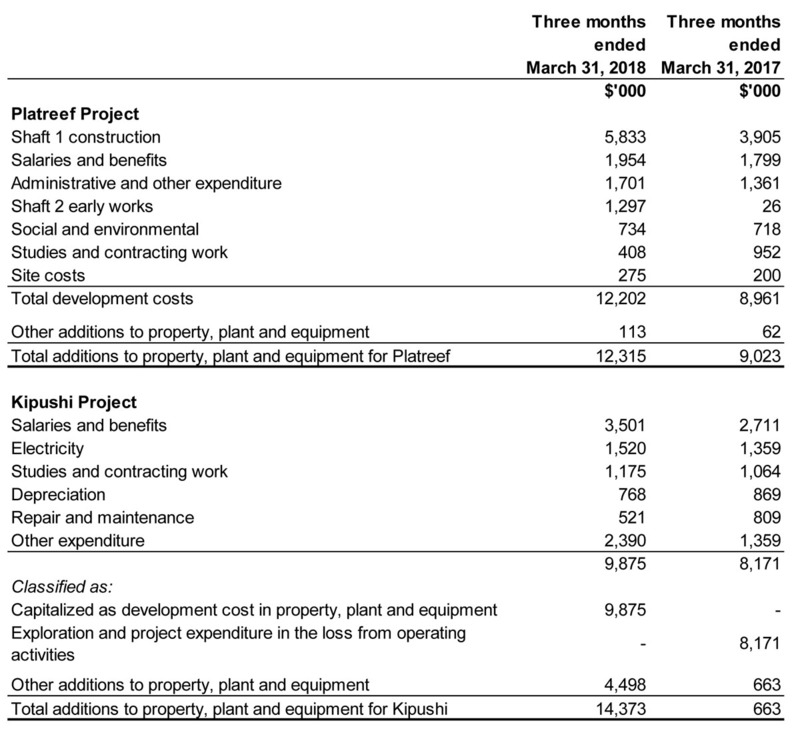 The decrease is attributable to the capitalization of costs incurred at the Kipushi Project subsequent to the finalization of its pre-feasibility study in December 2017. With the focus at the Kipushi and Platreef projects being on development and the Kamoa-Kakula Project being accounted for as a joint venture, the total $1.4 million exploration and project expenditure in Q1 2018 related to exploration at Ivanhoe’s 100%-owned Western Foreland exploration licences. In Q1 2017, $8.2 million of the total $8.3 million exploration and project expenditure related to the Kipushi Project. The costs associated with mine development are capitalized as development costs in Kamoa Holding, while the exploration expenditure is expensed. Capitalization of costs at Kakula commenced during Q2 2017, coinciding with the start of the Kakula box cut. Exploration drilling at Kakula West and in the saddle area between Kakula West and Kakula still is expensed. The interest expense in the Kamoa Holding joint venture relates to shareholder loans where each shareholder is required to fund Kamoa Holding in an amount equivalent to its proportionate shareholding interest. The company is advancing Crystal River’s portion on its behalf in return for an increase in the promissory note due to Ivanhoe. Finance income for the three months ending March 31, 2018, amounted to $10.4 million, and was $4.0 million more than for the same period in 2017 ($6.4 million). The increase mainly was due to interest earned on loans to the Kamoa Holding joint venture to fund operations that amounted to $8.7 million in 2018, as the accumulated loan balance increased. The company’s total assets decreased by $1.6 million, from $1,271.3 million as at December 31, 2017, to $1,269.7 million as at March 31, 2018. The company utilized $10.5 million of its cash resources in its operations and received interest of $1.1 million during Q1 2018. The company’s investment in the Kamoa Holding joint venture increased by $12.7 million from $552.4 million as at December 31, 2017, to $565.1 million as at March 31, 2018, with each of the current shareholders funding the operations equivalent to their proportionate shareholding interest. The company’s portion of the Kamoa Holding joint venture cash calls amounted to $11.2 million during the three months ending March 31, 2018, while the company’s share of comprehensive loss from the joint venture amounted to $7.2 million. Property, plant and equipment increased by $34.8 million, with a total of $27.2 million being spent on project development and to acquire other property, plant and equipment, $12.3 million and $14.4 million pertained to development costs and other acquisitions to property, plant and equipment of the Platreef Project and Kipushi Project respectively. The company had $134.6 million in cash and cash equivalents as at March 31, 2018. At this date, the company had consolidated working capital of approximately $138.0 million, compared to $181.9 million at December 31, 2017. The Platreef Project’s restricted cash has been fully utilized and the project’s current expenditure is being funded solely by Ivanhoe as the Japanese consortium of ITOCHU Corporation, Japan Oil, Gas and Metals National Corporation and Japan Gas Corporation have elected not to contribute to current expenditures. Since the Platreef Project’s restricted cash was fully utilized, the company has contributed a total of $6.7 million on behalf of the Japanese consortium. Since December 8, 2015, each shareholder in Kamoa Holding has been required to fund Kamoa Holding in an amount equivalent to its proportionate shareholding interest. The company is advancing Crystal River’s portion on its behalf in return for an increase in the promissory note due to Ivanhoe. The company’s main objectives for 2018 at the Platreef Project are the continuation of Shaft 1 construction, securing a bulk-water supply and completion of early-works construction of Shaft 2. At Kipushi, the principal objective is the completion of the feasibility study and continued upgrading of mining infrastructure. At the Kamoa-Kakula Project, priorities are the continuation of decline construction at Kakula and the completion of a pre-feasibility study for Kakula. The company has budgeted to spend $52 million on further development at the Platreef Project; $48 million at the Kipushi Project; $10 million on regional exploration in the DRC; and $14 million on corporate overheads for the remainder of 2018 – as well as its proportionate funding of the Kamoa-Kakula Project, expected to be $42 million for the remainder of 2018. Of the budgeted amounts, an aggregate of $55 million, which excludes the company’s proportionate funding of the Kamoa-Kakula Project, is committed expenditure with the balance either discretionary or not contractually committed at March 31, 2018. Continuation of the company as a going concern is dependent upon establishing profitable operations, the confirmation of economically recoverable reserves, and the ability of the company to obtain further financing to develop its projects. Although the company has been successful in raising funds in the past, the company’s access to financing always is uncertain and there can be no assurance that additional funding will be available to the company in the near future. Continuing strategic discussions concerning Ivanhoe Mines and its projects are ongoing with several significant mining companies and investors across Asia, Europe, Africa and elsewhere. Several investors that have expressed interest have no material limit on the provision of capital. There can be no assurance that the company will pursue any transaction or that a transaction, if pursued, will be completed. This news release should be read in conjunction with Ivanhoe Mines’ Q1 2018 Financial Statements and Management’s Discussion and Analysis report available at www.ivanhoemines.com and at www.sedar.com . The Kipushi 2017 Prefeasibility Study Technical Report dated January 25, 2018, prepared by OreWin, The MSA Group, SRK Consulting (South Africa) and MDM (Technical) Africa, covering the company’s Kipushi Project. These technical reports include relevant information regarding the effective dates and the assumptions, parameters and methods of the mineral resource estimates on the Platreef Project, the Kipushi Project and the Kamoa-Kakula Project cited in this news release, as well as information regarding data verification, exploration procedures and other matters relevant to the scientific and technical disclosure contained in this news release in respect of the Platreef Project, Kipushi Project and Kamoa-Kakula Project. Certain statements in this news release constitute “forward-looking statements” or “forward-looking information” within the meaning of applicable securities laws. Such statements and information involve known and unknown risks, uncertainties and other factors that may cause the actual results, performance or achievements of the company, its projects, or industry results, to be materially different from any future results, performance or achievements expressed or implied by such forward-looking statements or information. Such statements can be identified by the use of words such as “may”, “would”, “could”, “will”, “intend”, “expect”, “believe”, “plan”, “anticipate”, “estimate”, “scheduled”, “forecast”, “predict” and other similar terminology, or state that certain actions, events or results “may”, “could”, “would”, “might” or “will” be taken, occur or be achieved. These statements reflect the company’s current expectations regarding future events, performance and results and speak only as of the date of this release. Such statements include without limitation, the timing and results of: (i) statements regarding Shaft 1 providing initial access for early underground development at the Flatreef Deposit; (ii) statements regarding the station development of Shaft 1 at the 750-, 850- and 950-metre levels; (iii) statements regarding Shaft 1 expected to intersect the upper contact of the Flatreef Deposit (T1 mineralized zone) at an approximate shaft depth of 783 metres; (iv) statements regarding Shaft 1 reaching the planned, final depth at 980 metres below surface in 2019; (v) statements regarding the timing of Shaft 2 development, including that excavation of the box cut and construction of the tower hitch foundation be completed by the end of the year and that Shaft 2 will be sunk to a final depth of more than 1,100 metres; (vi) statements regarding the operational and technical capacity of Shaft 1; (vii) statements regarding the internal diameter and hoisting capacity of Shaft 2; (viii) statements regarding the company’s plans to develop the Platreef Mine in three phases: an initial annual rate of four million tonnes per annum (Mtpa) to establish an operating platform to support future expansions; followed by a doubling of production to eight Mtpa; and then a third expansion phase to a steady-state 12 Mtpa; (ix) statements regarding the planned underground mining methods of the Platreef Project including long-hole stoping and drift-and-fill mining; (x) statements regarding supply of treated water from the town of Mokopane’s new Masodi treatment plant; (xi) statements regarding the timing of the study and construction on the Kipushi-Munama spur line; (xii) statements regarding the timing and completion of a pre-feasibility study for a six Mtpa mine at Kakula; (xiii) statements regarding the timing, size and objectives of drilling and other exploration programs for 2018 and future periods; (xiv) statements regarding exploration on the Western Foreland exploration licenses; (xv) statements regarding completion of the twin declines at Kakula scheduled for completion of the contract by the end of 2018; (xvi) statements regarding the timing of an update to the Kipushi Mineral Resource estimate in Q2 2018; (xvii) statements regarding the timing and completion of a definitive feasibility study at the Kipushi Project in the second half of 2018; and (xviii) statements regarding expected expenditure for 2018 of $52 million on further development at the Platreef Project; $48 million at the Kipushi Project; $10 million on regional exploration in the DRC; and $14 million on corporate overheads for the remainder of 2018 – as well as its proportionate funding of the Kamoa-Kakula Project, expected to be $42 million for the remainder of 2018. As well, all of the results of the pre-feasibility study of the Kamoa-Kakula Project and preliminary economic assessment of development options for the Kakula deposit, the feasibility study of the Platreef Project and the pre-feasibility study of the Kipushi Project, constitute forward-looking statements or information, and include future estimates of internal rates of return, net present value, future production, estimates of cash cost, proposed mining plans and methods, mine life estimates, cash flow forecasts, metal recoveries, estimates of capital and operating costs and the size and timing of phased development of the projects. Furthermore, with respect to this specific forward-looking information concerning the development of the Kamoa-Kakula, Platreef and Kipushi Projects, the Company has based its assumptions and analysis on certain factors that are inherently uncertain. Uncertainties include: (i) the adequacy of infrastructure; (ii) geological characteristics; (iii) metallurgical characteristics of the mineralization; (iv) the ability to develop adequate processing capacity; (v) the price of copper, nickel, zinc, platinum, palladium, rhodium and gold; (vi) the availability of equipment and facilities necessary to complete development; (vii) the cost of consumables and mining and processing equipment; (viii) unforeseen technological and engineering problems; (ix) accidents or acts of sabotage or terrorism; (x) currency fluctuations; (xi) changes in regulations; (xii) the compliance by joint venture partners with terms of agreements; (xiii) the availability and productivity of skilled labour; (xiv) the regulation of the mining industry by various governmental agencies; and (xiv) political factors. This release also contains references to estimates of Mineral Resources and Mineral Reserves. The estimation of Mineral Resources is inherently uncertain and involves subjective judgments about many relevant factors. Estimates of Mineral Reserves provide more certainty but still involve similar subjective judgments. Mineral Resources that are not Mineral Reserves do not have demonstrated economic viability. The accuracy of any such estimates is a function of the quantity and quality of available data, and of the assumptions made and judgments used in engineering and geological interpretation (including estimated future production from the company’s projects, the anticipated tonnages and grades that will be mined and the estimated level of recovery that will be realized), which may prove to be unreliable and depend, to a certain extent, upon the analysis of drilling results and statistical inferences that ultimately may prove to be inaccurate. Mineral Resource or Mineral Reserve estimates may have to be re-estimated based on: (i) fluctuations in copper, nickel, zinc, platinum group elements (PGE), gold or other mineral prices; (ii) results of drilling; (iii) metallurgical testing and other studies; (iv) proposed mining operations, including dilution; (v) the evaluation of mine plans subsequent to the date of any estimates and/or changes in mine plans; (vi) the possible failure to receive required permits, approvals and licenses; and (vii) changes in law or regulation. The company’s actual results could differ materially from those anticipated in these forward-looking statements as a result of the factors set forth in the “Risk Factors” section and elsewhere in the company’s Q1 2018 Financial Statements and Management’s Discussion and Analysis.